Family fun is everywhere in San Luis Obispo County (SLO CAL). Bypass the typical and explore the unexpected right here on the Central Coast of California. Be ocean bound as you learn to surf in Pismo Beach. Climb the ladder and conquer your fears on a ropes course. Saddle up and kick-up some sand on horseback while watching for a passing pod of whales. No matter your lifestyle, SLO CAL has 10 unexpected, kid-approved adventures to add to your next vacation itinerary. Nothing says classic California like surfing in Pismo Beach. The water may be a bit colder but nothing will stop you once you pop up on that board for the first time. Learn from some of the best instructors around and hang 10 but watch out, you might get addicted. Dunes near the ocean? You read that right! Oceano has one of the only drive-on beaches in California and is also where visitors are able to ride atvs, dune buggies and Hummers over towering sand dunes until their heart&apos;s content. Book a Hummer tour and take in breathtaking views of the Pacific Ocean while learning about the local area and points of interest. Ziplining over vineyards is fun for the whole family (especially if mom and dad get to go wine tasting afterwards). At Margarita Adventures you&apos;ll learn all about the Manhattan size property that prehistoric oyster shells, acres of vineyards, various wildlife and six awesome ziplines call home. Let the kids race on the new double-barrel, tandem zipline then soar over pinot noir vineyards and through a replica gold mining camp. Make the memories last and rent a GoPro helmet cam! Explore a truly unique and hidden gem in SLO CAL. Book a tour with Central Coast Kayaks to traverse the waters of Pismo Beach and experience spectacular grottoes, scenic vistas, beautiful arches and breathtaking coves. These tours are for the novice and experienced paddler. You&apos;ll get a knowledgeable guide, learn the basic strokes and be geared up with everything you&apos;ll need to enjoy a morning paddle. There&apos;s nothing quite like horseback riding on the beach in a beautiful California setting. Located between Avila Beach and Morro Bay, explore Montaña de Oro State Park with Central Coast Trailrides. 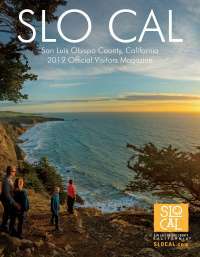 Whether you jump off for a quick look through the tidepools or set up an oceanside picnic with the family, saddleup and explore SLO CAL. Morro Bay is a premier fishing site where local fisherman bring in everything from oysters and crab to lingcod and halibut. Don&apos;t let them have all the fun though, book a deep sea fishing excursion with Sub Sea Tours and catch your dinner yourself. If you&apos;re really lucky, you may even see a passing pod of whales or dolphins. Get a feel for the country life in Santa Margarita. Whether you spend the weekend at Lazy Arrow Outdoor Adventures (Camatta Ranch) or just go for the day, you&apos;ll be able to spend your time exploring this 32,000 acre cattle and exotic animal ranch until the buffalo come home (yes they have free roaming buffalo). Experience a ranch life tour or simply go on a wildflower hike. You don&apos;t have to drive all the way up to Big Sur to experience beautiful hiking trails. Ragged Point, located along California Highway 1, offers up gorgeous views, coastal wilderness and an outdoor experience you&apos;ll only get on the Central Coast. To get to this hike, travel north on Highway 1 until you see a gate and fire road on the right hand side of the road about .2 miles south of the Ragged Point Inn. What happens when you combine a thrilling ropes course and ziplining? A fun, kid-approved day at Vista Lago Adventure Park in Arroyo Grande near Lopez Lake. Choose from four different courses in the Upper Park offering things for beginners, intermediate adventurers, advanced thrill-seekers and high-intensity adventures, or go straight for the ziplines and Quick Jump. Or if you&apos;re not quite sure about heights, check out their Beginner Park for a closer-to-the-ground experience. Learn about SLO CAL&apos;s coastal aquatic life at the Central Coast Aquarium in Avila Beach. Get hand&apos;s-on with creatures found in local tide pools just steps from the Aquarium. Afterwards, grab a pit down on Olde Port Beach and spend your evening around the bonfire.